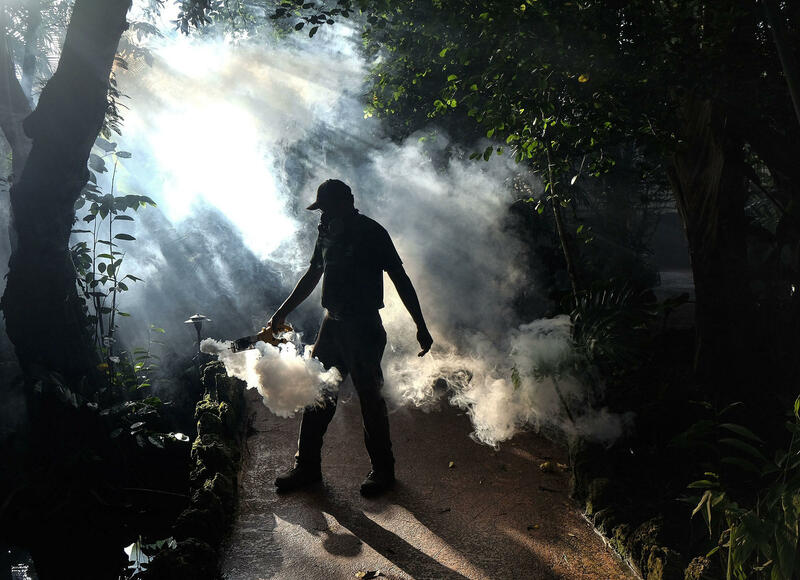 A groundskeeper at Pinecrest Gardens sprays pesticide to kill mosquitoes in Miami-Dade County, Fla., in 2016. Last year's Zika outbreak in Miami likely started in the spring of 2016, with the virus introduced multiple times before it was detected, researchers say. And most of those cases originated in the Caribbean. The study, published Wednesday in Nature, examined more than 250 cases of local Zika transmission in three Miami neighborhoods. Researchers analyzed 39 Zika virus genomes isolated from 32 people who had been infected and seven Aedes aegypti mosquitoes, the species that carries Zika. Comparison of differences in those genomes finds the virus was introduced by travelers at least four and perhaps as many as 40 different times as early as March 2016. Local transmission of Zika wasn't confirmed in Miami until late July. The study concludes that Miami's Zika outbreak was caused mostly by infected travelers arriving from the Caribbean, the region with the highest incidence of the disease. "Miami and South Florida particularly had this correspondence of lots of travelers from the Caribbean as well as high densities of Aedes aegypti that could support local transmission," says Derek Cummings, a professor of biology at the University of Florida and one of the study authors. "Both the genetics and the travel data supported that the majority of locally acquired Zika cases were coming from Caribbean origin." Some 3 million travelers from the Caribbean arrived in Miami between January and June last year. The majority, 2.4 million, arrived aboard cruise ships. The researchers caution that doesn't mean cruise ships are risk factors for Zika transmission, only that they are a major mode of transportation from areas where the disease was active. According to the study, Miami is one of the few places in the continental U.S. with enough foreign travelers and a high enough density of Aedes aegypti mosquitoes to be at risk for Zika. The study authors say they think Florida is unlikely to see another Zika outbreak unless it's sparked by one elsewhere in the Americas. While Zika remains active and continues to be spread in areas with high numbers of Aedes aegypti, outbreaks appear to have peaked in many areas. Brazil is reporting that Zika cases are down by 95 percent from last year and has declared an end of its public health emergency. Cummings says: "Cases in the Americas are on the decline compared to last year. So we might see fewer cases just because there are fewer cases happening in the rest of the hemisphere." The Miami study is one of three featured this week in Nature using genomic analysis to trace the spread of the Zika virus through the Americas. In a commentary, Michael Worobey, a professor of ecology and evolutionary biology at the University of Arizona, says this kind of analysis needs to become part of the first-line response to future infectious disease outbreaks. "We should be detecting such outbreaks within days or weeks through routine, massive, sequence-based approaches," he writes, "not months or years later, when clinical symptoms have accumulated."